This past Thursday at the Oakland campus of California State University, East Bay, BayNet and the Special Libraries Association – San Francisco Bay Chapter (SLA-SF) held their joint annual meeting. Appetizers and drinks were made available to attendees (both of which were fantastic) during the networking portion of the meeting. Librarians from all walks of life rubbed shoulders and squeezed into a hallway — so as to be closer to the food and drink — for the better part of an hour, trading stories and getting to know each other. After everyone had enjoyed their fill and settled into their seats, a raffle was held in which three gift certificates to Buffalo Bill’s Brewery in Hayward as well as a trip for eight to wine tasting at Concannon Vineyard. And once the victors received their lovely gifts, the main attraction settled into her place at the head of the room. 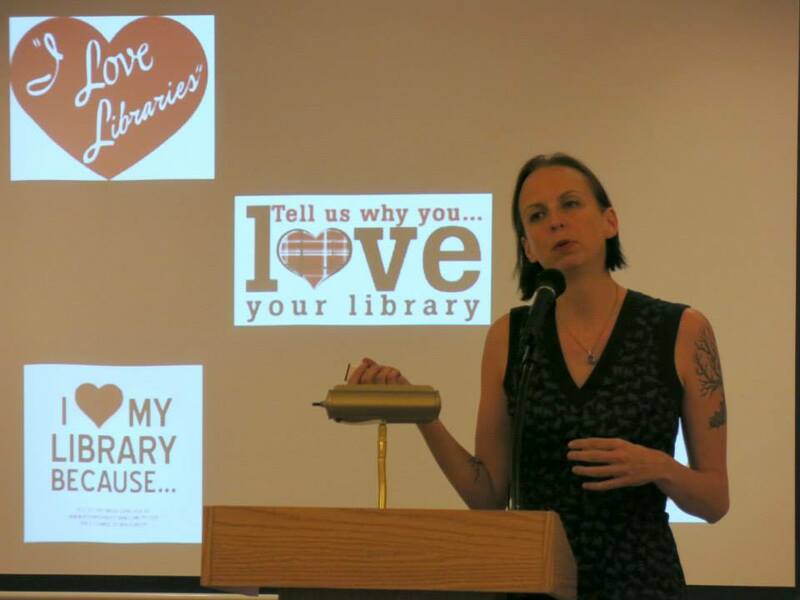 Sarah Houghton, Director of the San Rafael Public Library and also known as the Librarian in Black, gave a presentation entitled: “The Wrong Love: Why We Need to Stop Telling People to Love Libraries”. The primary thrust of the presentation is that the current marketing tactics being embraced by libraries and librarians in the United States is flawed. Instead of asking people to love their libraries, we should instead be telling our patron communities how much we love them. The presentation was engaging and insightful and drove people to ask many good questions, perhaps a few more than Ms. Houghton was prepared for, but better too many than too few, right? I thoroughly enjoyed the event and I hope that those who were able to attend felt the same way. Keep an eye here for announcements about more BayNet events in the future, like the upcoming Day of the Book Writer’s Conference at JFK University. Hope to see you there! Brewster Kahle, successful entrepreneur, visionary and leader of non-profits, has been pursuing the goal of universal access to all knowledge. He is the founder and digital librarian of perhaps the world’s largest digital library, the Internet Archive. Interview: Google Faces Antitrust Investigation for Agreement to Digitize Millions of Books Online. Democracy Now!, April 30, 2009. Please note this is not a San Francisco Public Library sponsored event and you do not have to be a BayNet member to attend.